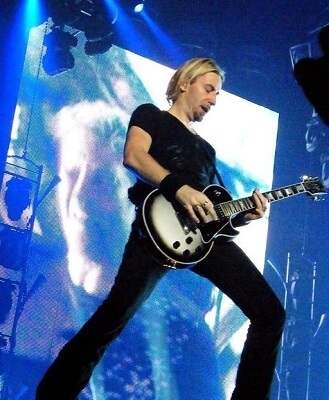 Get notified when Nickelback tickets are available! Nickelback is a rock band from Hanna, Alberta, Canada, that was formed in the year 1995. The band is made up of vocalist and guitarist Chad Kroeger, keyboardist and vocalist Ryan Peake, drummer Daniel Adair and bassist Mike Kroeger. Nickelback is one of the most successful Canadian groups ever, selling more than 50 million albums globally. The group ranks as the eleventh best-selling musicians and is the second best-selling foreign act of the 2000s right behind the Beatles. They have also been ranked by Billboard as the most successful rock band of the decade with songs such as “How You Remind Me” and “Photograph.” Get your Nickelback tickets below to see their songs performed live.